Home CHARITY/ COMMUNITY SERVICE MTAANI NEWS Red Cross, Jungle Foundation join forces to support to Umoja fire victims. Red Cross, Jungle Foundation join forces to support to Umoja fire victims. 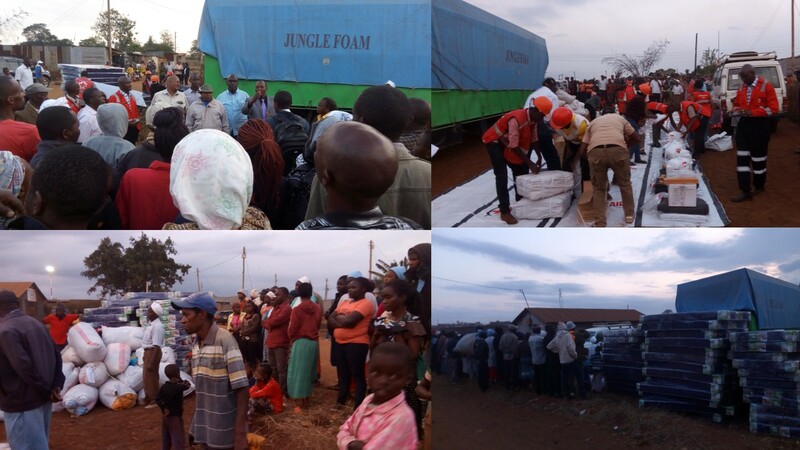 A photo grid of some of the rescue and donation mission by the Central Kenya Regional Branch of Kenya Red Cross Society (KRCS) and the Jungle Foundation. Central Kenya Regional Branch of Kenya Red Cross Society (KRCS) and the Jungle Foundation have come together to assist the over 300 people who were affected by the Monday afternoon infernal in Umoja Estate Thika with emergency essentials worth tens of thousands of Kenya shillings. While working closely with the local administration on the ground, the two organisations have in the last two days mapped out emergency relief efforts and support to the victims with the Red Cross emergency response volunteers providing practical and emotional support since the fire broke out. About 40 households were on Monday night placed in emergency accommodation and with the Red Cross working through the night to provide assistance to those in need. The two groups have ensured that the families had a place to sleep and at least gotten a meal as they prepared them to accept and move on. Tuesday evening, the Red Cross donated tents, kitchenware, toiletries, clothing and blankets to the victims while Jungle Foundation gave out blankets and mattresses to each of the affected families. The two organisations plus a few individual well-wishers also donated foodstuffs to the victims. The Central Regional manager of the Red Cross Gitonga Mugambi was humbled by the kind gesture showed by Thika MP-Elect Eng. Patrick Wainaina Wa Jungle who offered to transport the Red Cross’s consignment all the way from their Nanyuki warehouses to Thika. He appealed to other leaders to emulate the MP as his organisation depended fully on well-wishers to execute their rescue and emergency missions. “When something as appalling as fire happens it is absolutely natural that people want to help. We have launched an appeal to the authorities in this county as well as the county government to help give to a cause that desperately needs their help and to complement the amazing charitable work happening in this community,” said Gitonga. He cautioned civilians against risks that ended up causing such disasters adding that they would continue educating the masses on disaster prevention measures and management. “As we appeal to you to be extra cautious in your homes, we would also appeal to the county government to organise access roads in such settlements so as to make it easy for fire fighters to curb fires more efficiently,” he added. On behalf of Eng. Patrick Wainaina who is away on official assignment, his Personal Assistant Mr. John Mwangi Njuguna promised to work with all stakeholders to ensure the victims were cushioned from the effects of their loss so that they could be able start all over again without much difficulties. “I know very well that no amount of money or material assistance can take away your pain for the past couple of days, but for people who have lost everything we hope our little gesture will help towards rebuilding your lives. Thank you to everyone who has given and thank you to our partners for helping find a sensible way to assist to the people who need it as soon as possible,” said Mwangi. Area Chief Simon Kamau promised to assist all those who lost their vital document in the fire by enhancing their replacement. He however warned anyone found selling any of the items donated to them that his office would not hesitate taking legal action against them as this was tantamount to abusing the generosity of their donors.